Metal-detecting and surveying undertaken here between 1997 and 2013 has recovered a large and diverse assemblage of finds. The numerous Roman objects that have been collected suggest a settlement of some kind was present at this site, potentially associated with the evidence for a metalworking industry. The Roman finds include over eight hundred coins, a coin blank, pottery, tiles, brooches, finger-rings, a cosmetic pestle, furniture fittings and a military belt fitting. Other finds recovered include Mesolithic to Bronze Age and undatable prehistoric worked flints (including two Mesolithic tranchet axeheads); Iron Age, Early and Middle Saxon, medieval and post-medieval pottery sherds; medieval brick and roof tile fragments; Iron Age, medieval and post-medieval coins; post-medieval jettons and a range of other Bronze Age to post-medieval metal objects. The metal finds include undatable casting waste; a Middle-Late Bronze Age rapier; medieval/post-medieval dress accessories; a medieval thimble and lead grille or ventilator; a medieval/post-medieval iron candle-holder, copper alloy vessel fragments and clapper bell and a post-medieval seal matrix, harness fitting, harness mounts and lead cloth seals. Roman sherds and iron slag. Scatter of slag 40m in diameter. Density about four per square metre. R.J. Rickett (NAU), 25 July 1990. Fourteen Roman coins, brooch, key and cockerel figurine (S2). Post medieval coins, tokens and hooked tag. See list and coin form in file. D. Gurney (NLA), 20 January 1998. Lead weight, possibly Late Saxon or early medieval. D. Gurney (NLA) 13 March 1998. Four post medieval coins and tokens. See coin form in file. Early post medieval harness mount: conical, hollow underside, narrow rim flange, dimpled boss at centre and stubs of 2 spikes on reverse. Diameter 22mm. Compare with a smaller example from NHER 32962 (Corpusty). A. Rogerson (NLA) 9 October 1998. Undated casting jet, fifteen Roman coins and one brooch. See list and coin forms in file. D. Gurney (NLA) 9 February 1999. December - January 1998. Metal detecting. 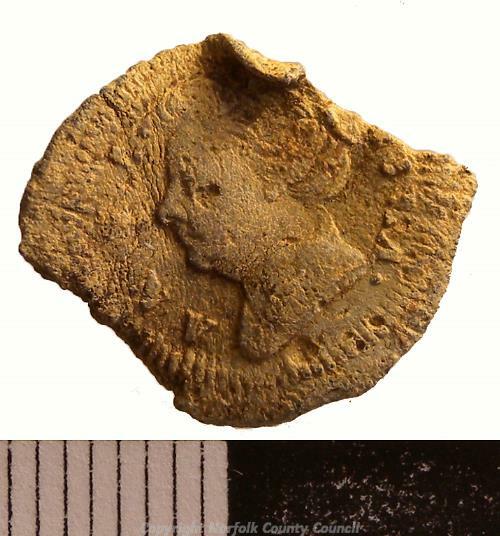 Post medieval token and jettons. Roman, ?Early Saxon, medieval and post medieval metal finds. April-May 1999 and July-August 1999. Metal detecting. Sixteen metal objects, ?Iron Age-Post medieval. K. Hinds (NLA), 18 February 2000. Later part of 2000. Metal detecting. January - February 2005. Metal-detecting. 1 Roman coin and 26 pottery sherds (greyware). 3 undated lumps of iron slag. Coins identified by A. Marsden (NLA) and other objects by A. Rogerson (NLA). See lists in file. A. Rogerson (NLA), 11 March 2005. Updated by J. Page (HES), 13 February 2014. February - March 2005. Metal-detecting. 14 Roman pottery sherds (13 greyware). 3 medieval pottery sherds (Grimston). 4 post-medieval/modern pottery sherds and 1 tile fragment. Identified by A. Rogerson (NLA). See list in file. A. Rogerson (NLA), 14 April 2005. Updated by J. Page (HES), 19 February 2014. April - May 2005. Metal-detecting. 10 Roman coins, 51 pottery sherds (45 Greyware, 2 oxidised, 1 shell tempered, 2 Nene valley, 1 East Anglian colour coated) and 1 furniture fitting. 1 medieval buckle plate (gilt) and 1 buckle frame. 1 post-medieval coin, 1 pottery sherd (iron glazed), 1 scale-tang knife end cap, 1 spur fitting and 1 book clasp fragment. 1 undatable lead ?weight and 6 lead weights. Coins identified by A. Marsden (NLA), pottery by A. Rogerson (NLA) and other objects identified by S. Ashley (NLA). See lists in file. A. Rogerson (NLA), 17 June 2005. Updated by J. Page (HES), 3 March 2014. May - June 2005. Metal-detecting. 1 prehistoric flint flakes and 1 retouched flint flake. 1 Iron Age coin (Iceni). 82 Roman coins, 3 brooches, 1 vessel handle, 2 finger rings, 1 cosmetic pestle, 1 spatula handle (with bust of Minerva on the end) and 2 ?bracelet fragments. 1 ?Roman decorative stud (S3). 2 medieval coins, 1 ?furniture fitting, 1 belt mount, 1 buckle and 1 vessel handle (S4). 6 medieval/post-medieval vessel fragments, 2 lead window came fragments and 1 ?thimble. 3 post-medieval coins, 2 tokens (Litcham and Mileham), 2 buttons (1 silver), 2 crotal bells, 3 buckle frames, 3 book clasps, 2 belt mounts and 1 sword-belt mount. 1 post-medieval/modern handle of lead ?tobacco jar. 1 undatable ?furniture fitting, 8 lead weights, 1 ring, 2 lead pot mends, 2 casting jets and 6 lumps of casting waste (inc 3 lead). Flints identified by P. Robins (NCM), coins by A. Marsden (NLA) and other objects by S. Ashley (NLA). See lists in file. A. Rogerson (NLA), 18 July 2005. Updated by J. Page (HES), 18 February 2014. 1 ?Neolithic retouched blade and 1 retouched flake. 27 Roman coins, 296 pottery sherds (including 268 Greyware, 8 Samian, 2 amphorae, 1 Oxfordshire mortarium, 2 Nene Valley mortaria, 2 Nene Valley, 1 East Anglian mortarium, 2 shelly), 1 tile fitting, 1 ?furniture mount (head of mercury as part of design) (S5), 1 steelyard, 1 lead steelyard weight, 1 hair pin and 1 fragment of openwork military buckle or mount. 21 ?Roman fragments of iron smelting slag, 1 fragment of vitrified slaggy material and 2 iron hooks. 1 Late Saxon bell fragment. 4 medieval coins, 25 pottery sherds (including 9 Grimston), 1 folding clasp fragment, 2 keys, 1 mount, 1 iron prick spur and 1 lead pot mend. 2 medieval/post-medieval lead pot mends, 1 lead weight/spindle whorl, 2 vessel fragments, 1 ?vessel ?repair and 1 clapper bell fragment. 1 post-medieval coin, 1 jetton, 16 pottery sherds (including 1 Base of a chafing dish), 1 belt mount, 1 rowel spur, 1 casket hinge plate, 2 buttons, 4 buckle frames, 4 lead sheet metal-working scraps and 4 fragments of lead window came. 1 post-medieval/modern unidentified object and 1 rectangular plate. 9 undatable lumps of metal working waste (inc 1 lead droplet), 2 lead weights/spindle whorls, 1 lead weight, 1 ring and 3 wound glass beads. E. Darch (NLA), 11 August 2005. Updated by J. Page (HES), 18 February 2014. Bird or reptile head stud found May/June 2005 may be Early Saxon, see (S1). A. Rogerson (NLA), 12 September 2005. July - August 2005. Metal-detecting. 57 Roman pottery sherds (including 1 Samian, 47 greyware) and 1 tile fragment. A. Rogerson (NLA), 18 September 2005. Updated by J. Page (HES), 6 February 2014. The large number of Roman finds collected suggests that there was a Roman settlement on this site. D. Robertson & A. Rogerson (NLA), 19 September 2005. 2 Prehistoric flint retouched ?flakes. 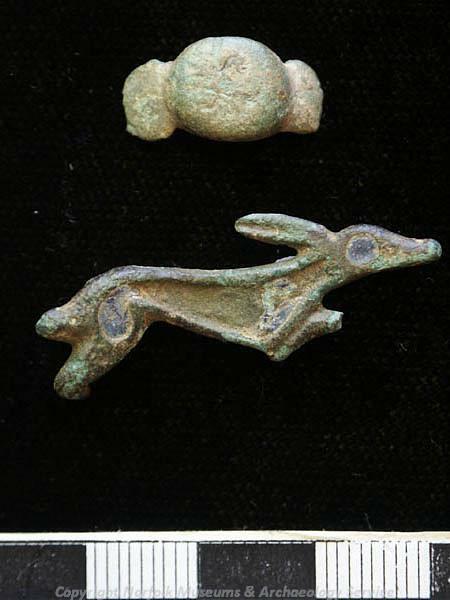 2 medieval coins and 1 leash swivel (S6). Flints identified by P. Robins (NCM), coins by A. Marsden (NLA) and other objects by S. Ashley (NLA). See lists and (S2) in file. A. Rogerson (NLA), 31 October 2005. Updated by J. Page (HES), 6 March 2014. 3 Iron Age pottery sherds (finely gritted). 2 Roman coins, 70 pottery sherds (59 greyware including some Nar valley, 6 miscellaneous, 2 Nene valley, 1 flange East Anglian, 2 shelly) and 1 tile. 10 medieval pottery sherds (7 unglazed, 3 glazed Grimston). 1 post-medieval coin, 1 pottery sherd (iron glazed red earthenware) and 1 belt mount. 1 undatable stone roof and 1 hone stone. Coins identified by A. Marsden (NLA), ceramic objects by A. Rogerson (NLA) and other objects by S. Ashley (NLA). See lists in file. A. Rogerson (NLA), 17 December 2005. Updated by J. Page (HES), 6 March 2014. 1 Prehistoric retouched flint flake (unpatinated). 1 medieval coin, 1 strap loop, 1 fragment of strap end, 1 belt mount, 1 silver button and 1 buckle frame. 2 medieval/post-medieval vessel fragments, 1 purse suspension loop and 1 lead window came fragment. 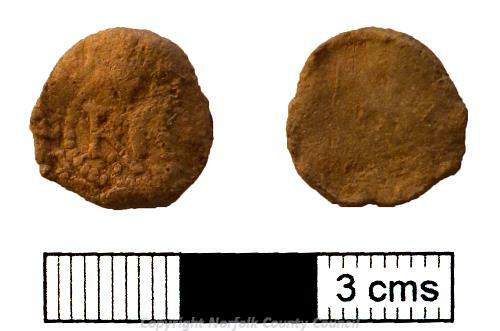 3 post-medieval coins, 1 button, 1 buckle frame, 1 dress fastener and 1 spur fragment. A. Rogerson (NLA), 16 January 2006. Updated by J. Page (HES), 13 February 2014. 20 Roman coins, 1 brooch and 1 bracelet. 1 undatable lump of casting waste. Coins identified by J. Davies (NLA) and other objects by S. Ashley (NLA). See lists in file. A. Rogerson (NLA), 19 February 2006. Twenty Roman coins and coin blank. A. Rogerson (NLA), 30 March 2006. 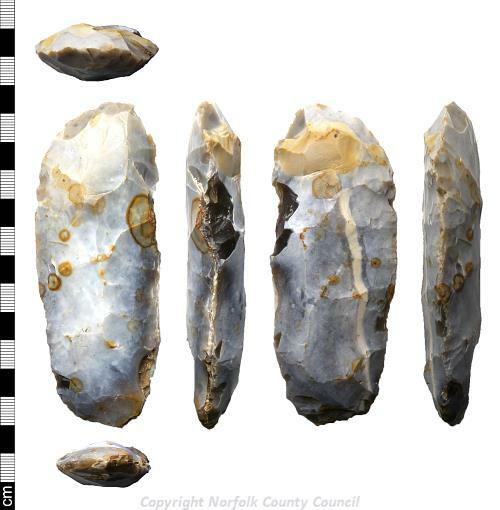 1 Mesolithic flint ?tranchet axe. 1 Early Neolithic flint knife (or unfinished laurel leaf). 32 Roman coins, 55 pottery sherds (including 46 greyware, 5 oxidised, 1 East Anglian mortarium, 1 Nene Valley colour coated, 2 East Anglian colour coated, 1 Samian), 1 bracelet fragment, 1 incomplete Dolphin brooch (c 55-80 AD) and 1 furniture nail/stud. 1 Late Saxon/medieval gilt unidentified mount (11th-12th century). 3 medieval coins, 7 pottery sherds (including 3 unglazed and 4 glazed Grimston) and 1 incomplete buckle frame (13th century). 1 medieval/post-medieval pottery sherd, 1 lead window came fragment and 1 vessel leg. 4 post-medieval pottery sherds (including 1 reduced with thick green glaze (16th century), 2 GRE and 1 late post-medieval brown glaze. ), 1 tinned belt mount (17th century), 1 buckle frame (17th-18th century), 1 lead ?casting jet, 1 purse bar fragment (16th century) and 1 lead trade weight (3oz). Flints identified by P. Robins (NCM), coins by A. Marsden (NLA), pottery by A. Rogerson (NLA) and other objects by S. Ashley (NLA). See lists in file. A. Rogerson (NLA), 13 April 2006. Amended by P. Watkins (HES), 5 August 2013. Updated by J. Page (HES), 20 February 2014. Iron Age, Roman, medieval and post medieval sherds. Eighty six Roman, four medieval and four post medieval coins, post medieval token and jetton. A. Rogerson (NLA), 24 April 2006. 1 ?Mesolithic/Early Neolithic rounded flint end scraper and 1 broken small blade. 1 ?Middle Bronze Age/Late Bronze Age possible rapier fragment (point only), (S7). 131 Roman coins, 39 pottery sherds (including 32 greyware, Nar Valley, 2 oxidised, 1 Samian, 1 East Anglian colour coated and 3 Nene Valley mortaria), 3 brooches (including 1 Dolphin (c. 40-65 AD), 1 incomplete Colchester two-piece (mid 1st century) and 1 gilt plate), 3 furniture studs/nails, 1 spoon fragment (probably 2nd century), 2 hairpin fragments, 2 bracelet fragments, 2 finger rings (one tiny), 1 lead steelyard weight, 1 steelyard arm fragment, 1 cylindrical lead weight and 1 manufacturing casting scrap (incomplete line of unfinished studs). 1 ?Roman plate mount possible from knife handle. 6 medieval coins, 2 horse-harness fittings (both 14th century), 1 incomplete bell fitting, 1 bar mount (13th-14th century, possibly from harness), 1 possible strap end, 1 oval buckle frame fragment and 2 irregular lead pot mends. 2 medieval/post-medieval coin weights, 1 weight, 1 buckle frame fragment (15th-16th century), 1 metalworker's hammer (15th-17th century), 3 vessel fragments and 2 sheet scraps. 5 post-medieval coins, 1 jetton, 2 tokens, 1 tinned sexfoil belt mount (17th century), 1 tinned buckle frame (late 16th-17th century), 6 buttons (2 lead), 1 thimble, 1 looped architectural fitting, 1 Jews' harp, 1 rectangular dress fitting with bearded head, 1 book clasp and 3 lead weights. 3 undated unidentified objects and 2 lumps of molten copper alloy metalworking debris. A. Rogerson (NLA), 16 May 2006. Amended by P. Watkins (HES), 5 August 2013. Updated by J. Page (HES), 6 February 2014. 10 Roman coins and 1 brooch. A. Rogerson (NLA), 26 August 2006. Updated by J. Page (HES), 18 February 2014. 14 Roman coins, 6 pottery sherds (Greyware) and 1 furniture nail/stud. 3 medieval lead pot mends. A. Rogerson (NLA), 17 September 2006. Updated by J. Page (HES), 19 February 2014. 8 Roman coins, 1 brooch (horse and rider) and 1 nail cleaner. 1 medieval coin and 1 composite buckle fragment. 1 post-medieval button and 1 lead cloth seal. A. Rogerson (NLA), 16 October 2006. Updated by J. Page (HES), 6 March 2014. 1 Late Prehistoric flint side-and-end scraper, 1 flint blade (blueish white patination) and 2 flint flakes. 88 Roman coins, 43 pottery sherds (36 greyware with unusual fabrics, 1 shelly, 3 Nene valley colour coated, 1 Nene Valley mortarium rim, 1 East Anglian mortarium, 1 Samian), 1 brooch (Langton Down), 1 brooch fragment (Hod Hill), 1 tweezer arm, 1 hairpin fragment, 1 military harness mount, 1 tinned/silvered spoon, 1 lock bolt, 1 ?key fragment, 1 ?furniture stud and 1 lead steelyard weight. 1 ?Roman ceramic crucible fragment. 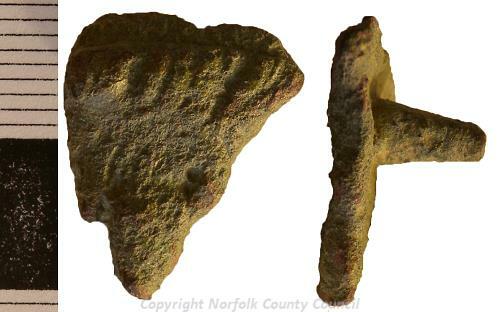 1 Middle Saxon pottery sherd (Ipswich). 1 Middle-Late Saxon ?hooked tag. 1 Late Saxon/medieval stone hone (schist). 2 medieval coins, 11 medieval pottery sherds (glazed), 1 roof tile, 7 buckles, 1 strap end, 1 ?folding strap clasp, 1 brooch fragment (annular) and 2 lead pot mends. 3 post-medieval coins, 4 pottery sherds (GRE), 1 token, 2 buttons (1 lead), 1 belt mount and 1 buckle chape plate. Flints identified by P. Robins (NCM), coins by A. Marsden (NLA), ceramic objects by A. Rogerson (NLA) and other objects by S. Ashley (NLA). See lists in file. A. Rogerson (NLA), 23 November 2006. Updated by J. Page (HES), 6 March 2014. 76 Roman coins, 1 brooch fragment (wing-and-fanbow), 1 ?bracelet, 1 silver finger ring, 1 patera or skillet , 1 lead steelyard weight and 3 furniture nails or studs. 1 ?Roman furniture nail and 1 snaffle bit. 4 medieval coins, 2 belt mounts, 2 strap ends, 1 book claps, 1 seal matrix (inscription) and 1 lead weight. 1 medieval/post medieval lead weight, 1 lead ?weight and 1 vessel fragment. 3 post-medieval coins, 2 tokens, 1 buckle frame fragment, 1 silver plated finger ring fragment, 2 buttons and 1 lead cloth seal. 1 undatable molten unidentified object fragment. A. Rogerson (NLA), 16 December 2006. Updated by J. Page (HES), 6 March 2014. 1 Roman coin, 1 ?coin blank, 6 pottery sherds (Greyware) and 1 tile fragment. 1 medieval coin, 5 pottery sherds, 1 roof tile fragment and 1 ?strap end fragment. 1 post-medieval pottery sherd and 1 belt mount. A. Rogerson (NLA), 12 April 2007. Updated by J. Page (HES), 20 February 2014. 18 Roman coins, 29 pottery sherds (Grimston), 1 silver finger ring and 2 brooches (1 Colchester type 1 dolphin). 2 medieval coins, 2 pottery sherds, 1 silver strap fitting, 1 seal matrix, 1 lead weight and 1 strap end. 1 post-medieval pottery sherd, 2 buckles, 4 buttons, 1 spoon and 1 furniture fitting. 3 undatable lumps of casting waste. A. Rogerson (NLA), 14 September 2007. Updated by J. Page (HES), 13 February 2014. 1 Late Bronze Age socketed axe fragment, (S9). 1 Iron Age brooch (La Tene I). 64 Roman coins, 2 brooches (1 horse and rider, 1 ?Hod Hill), 1 bracelet fragment, 1 key fragment, 1 nail/stud, 2 hairpin heads, 1 unidentified object suspension-unit and 1 ?child's gold finger ring. 6 medieval coins, 1 buckle, 1 leash swivel, 1 buckle pin and 1 casket key. 1 medieval/post-medieval unidentified object mount, 1 buckle frame and 1 strap end. 4 post-medieval coins, 1 sword chape, 2 buttons (1 lead), 1 tinned chape, 1 belt mount and 1 buckle. 1 undated ring fragment and 1 scrap of casting waste. A. Rogerson (NLA), 12 October 2007. Updated by J. Page (HES), 6 March 2014. 81 Roman coins, 40 pottery sherds (33 Greyware and Nar Valley reduced, 2 Nene Valley, 2 buff oxidised, storage jar, 1 Samian, 1 ?Oxfordshire red slipped), 3 tile fragments, 1 glass vessel fragment, 1 lock pin, 1 unidentified object, 1 finger ring, 1 lead standing weight, 1 ?bracelet and 1 furniture nail/stud. 1 ?Roman lava quern fragment (upper stone). 2 medieval coins, 2 pottery sherds (1 glazed Grimston, 1 Siegburg stoneware), 2 buckle pins, 1 buckle plate, 1 buckle frame, 1 four-part composite strap end (unusual), 1 strap loop, 5 lead pot mends and 2 buttons. 1 medieval/post-medieval vessel fragment (leg), 1 vessel repair and 2 buckle frames. 3 post-medieval coins, 1 token, 1 jetton, 1 pottery sherd (iron-glazed red earthenware), 1 tinned belt mount, 4 buttons (1 silver, 1 lead, 1 copper alloy, 1 pewter) and 1 lead cap from unidentified object. 3 undated rings, 1 cut-sheet staple and 1 silver lump. A. Rogerson (NLA), 17 December 2007. Updated by J. Page (HES), 6 March 2014. 56 Roman coins, 116 pottery sherds (103 Greyware and Nar valley, 1 shell tempered, 1 very large flagon rim, 3 Samian, 6 miscellaneous, 1 Oxfordshire, 1 ?East Anglian colour coated), 1 flue tile fragment and 1 bracelet. 2 medieval coins, 18 pottery sherds (4 unglazed, 14 unglazed Grimston), 1 strap end, 1 strap mount and 1 unidentified object. 2 medieval/post-medieval pottery sherds (LMT), 3 vessel fragments, 1 buckle frame (double looped), 1 pin and 1 nail. 6 post-medieval coins, 2 jettons, 9 pottery sherds (8 GRE, 1 salt-glazed stoneware), 2 buckle frame fragments, 2 shoe buckles, 1 harness/strap mount, 4 buttons (1 white metal coated), 2 lead cloth seals and 1 ?furniture nail. A. Rogerson (NLA), 17 October 2008. Updated by J. Page (HES), 6 March 2014. 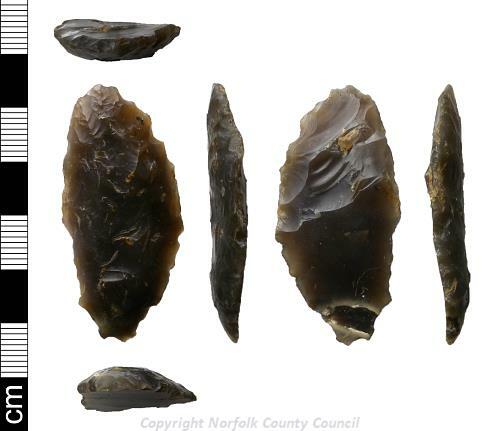 1 ?Bronze Age flint piercer. 18 Roman coins, 43 pottery sherds (36 greyware and Nar Valley, 2 oxidised, 1 Oxfordshire, 4 Nene Valley), 1 armlet fragment and 1 key. 4 medieval pottery sherds (unglazed), 2 belt bar mounts and 1 buckle plate. 1 medieval/post medieval lead weight. 1 post-medieval coin, 3 pottery sherds (glazed red earthenware), 1 lead powder charge cap or measure, 1 lead button, 1 buckle plate, 1 lead cloth seal, 2 furniture hinges, 1 shoe buckle, 1 spur fragment and 1 white-metal bell fragment. 1 undatable unidentified object (silver gilt), 1 vessel fragment (rim) and 1 ring. Flints identified by P. Robins (NCM), coins by A. Marsden (NLA), ceramic objects by A. Rogerson (NLA) and other objects by S. Ashley (NLA). See descriptions in file. Updated by J. Page (HES), 6 March 2014. 23 Roman, 1 medieval and 2 post-medieval coins, Roman nail and harness strap slide, Middle Saxon/ Late Saxon strap end, medieval strap end and buckle, medieval/ post medieval furniture fitting and probable coin weight, post medieval buckles, button and cloth seal and an undatable metal object. Prehistoric worked flints, Roman, medieval and post-medieval pottery sherds, 53 Roman, 2 medieval and 4 post-medieval coins, Roman brooch, bracelet, furniture fittings, steelyard weigh, medieval strap end, buckle, strap loop, pot mend, knife, medieval/post-medieval buckle, vessel, weight, post-medieval weight, book clasp, hooked tag, button, bell, buckle, cloth seal and undatable rings and vessel fragments. Very odd flint possible linen smoother, Iron Age, Romano-British, medieval and post-medieval sherds, 17 Roman and one post-medieval coin, Romano-British, medieval, medieval/post-medieval and post-medieval metal objects. A. Rogerson (HES), 18 October 2010. 27 Roman, 3 medieval and 1 post-medieval coin, post-medieval jetton, Romano-British sherd, Romano-British, medieval and post-medieval metal objects. A. Rogerson (HES), 15 November 2010. Before 14 November 2011. Metal-detecting. Prehistoric worked flints, Roman, Middle Saxon, medieval and post-medieval pot sherds, eleven Roman coins, Roman, medieval, post-medieval and undatable metal objects, post-medieval token & jettons. 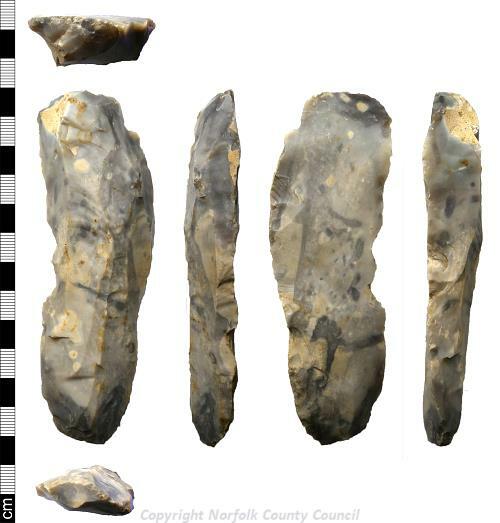 Neolithic/Bronze Age flint blades, tertiary flint flakes and an ovoid flint scraper. 13 Roman coins, brooches and a copper-alloy finger ring. 1 post-medieval coin, a button and a harness or belt mount. 15 Roman coins and nail. 10 Neolithic/Bronze Age flint flakes, mostly unretouched. Late Bronze Age copper alloy awl. 13 Roman coins, 29 pottery sherds, furniture stud and copper alloy nail. 1 Late Saxon pottery sherd. 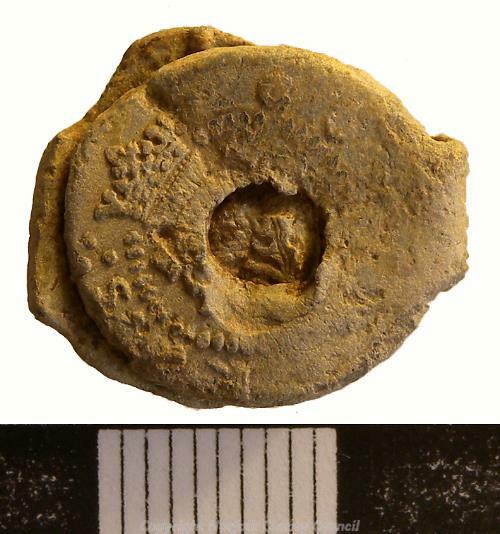 Late Saxon to post-medieval lead spindle whorl. 2 medieval coins, 3 pottery sherds, buckles, strap loop, strap end and lead grille or ventilator. 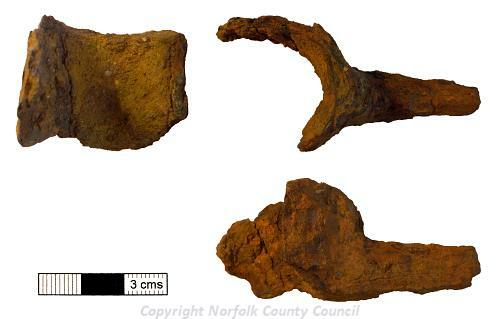 Medieval/post-medieval button, copper alloy vessel fragment and lead weights. 1 post-medieval jetton, 1 pottery sherd, button and lead cloth seals. P. Watkins (HES), 2 December 2013. --- Article in Serial: Gurney, D. (ed.). 2007. 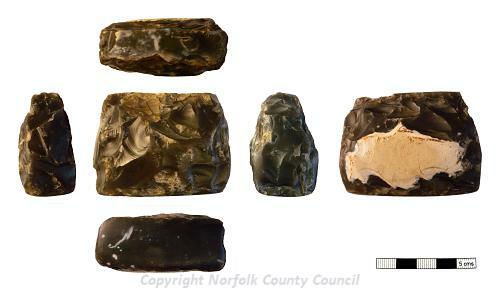 Archaeological Finds in Norfolk in 2006. Norfolk Archaeology. Vol XLV Pt II pp 250-261. p 250. <S1> Unpublished Document: Ager, B.M.. 2005. email from British Museum. <S2> Illustration: White, S.. 1998. Drawing of a Romano British copper alloy cockerel figurine.. Film. 2:1. <S3> Illustration: Gibbons, J.. 2005. Drawing of a Roman gilt stud.. Film. 2:1. <S4> Illustration: Gibbons, J.. 2005. Drawing of a Roman spatula handle.. Film. 2:1. <S5> Illustration: Gibbons, J.. 2005. Drawing of a Roman furniture mount.. Film. 2:1. <S6> Illustration: Gibbons, J. 2005. Drawing of a medieval swivel from leash.. Film. 2:1. <S7> Illustration: Ashley, S.. 2006. Drawing of a Middle/Late Bronze Age rapier fragment.. Film. 1:1. <S8> Illustration: Ashley, S.. 2006. Drawing of a Late Bronze Age socketed axe fragment.. Film. 1:1. <S9> Illustration: Gibbons, J.. 2007. Drawing of a Late Bronze Age socketed axe fragment.. Film. 1:1. <S10> Illustration: Gibbons, J.. 2010. Drawing of a medieval livery badge.. Film. 2:1.